If Jaime Garcia keeps pitching like this, David Price and Clayton Kershaw won’t be the only first-time arbitration eligible left-handers worth following this offseason. Garcia, the third-place finisher in last year’s National League Rookie of the Year balloting, enters tonight's start leading the league in wins and shutouts and third in the Senior Circuit with a 1.89 ERA. The 24-year-old has thrown 300 fewer innings than Kershaw and 175 fewer frames than Price, so his salary doesn’t figure to approach $6MM in 2012, as theirs might. 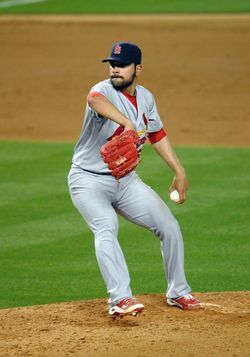 Tommy John surgery sidelined the Cardinals lefty in 2009, so he trails some other first-time arbitration eligible pitchers in important categories like wins, innings and strikeouts. However, Garcia doesn’t compare well with Shaun Marcum and Francisco Liriano, who are also veterans of Tommy John surgery. Both pitchers entered the arbitration process for the first time with little leverage, as their respective platform years were poor (Marcum missed the 2009 season and Liriano's '09 campaign was a dud). Garcia, on the other hand, figures to have lots of positives on his side this winter. He's 5-0 with an ERA under 2.00 and four times as many strikeouts as walks. Throw in an All-Star appearance, some postseason success or some Cy Young votes and his case would become even stronger. If he stays healthy, he’ll earn far, far more than what Liriano ($1.6MM) and Marcum ($850K) earned their first time through arbitration. Jordan Zimmermann, another Tommy John veteran who will go to arbitration for the first time this winter, doesn't measure up to Garcia in terms of career numbers, and isn't off to the same blazing start. On the other hand, Max Scherzer has pitched tremendously (6-0, 3.20 ERA, 51 Ks) so far and figures to have a stronger case than Garcia this winter because of the superior length and consistency of his career contribution. Looking back a year, there's Phil Hughes, who was born just two weeks before Garcia. He's another starter who went to arbitration without impressive ‘bulk’ stats. It won’t be easy, but Garcia could match the 31 career wins, 369 innings and 323 strikeouts Hughes had after 2010. And given his current pace, the Cardinals lefty could finish with a markedly better ERA, both for his career and his platform season (Hughes had a career 4.20 ERA after last year). That would help push Garcia’s 2012 earnings beyond Hughes’ current $2.7MM salary. There's no way Garcia will match the 51 wins or 671 2/3 innings Jered Weaver had when he went to arbitration for the first time, so Garcia can likely forget about a $4.365MM salary. But his career 2.72 ERA is a full run better than the 3.73 mark Weaver had after 2009, which will help Garcia and his representatives at TWC Sports. There’s little point in getting overly precise with arbitration predictions when so much of the season lies ahead, but it’s clear that Garcia could earn $3-4MM in 2012. Definite success for a pitcher who missed an entire season rehabbing from Tommy John surgery.